American former professional boxer, generally considered among the greatest heavyweights in the sport's history. Autograph poem signed “Muhammad Ali”. 1p., 8.5 x 11.0 inch, on "Muhammad Ali Farms" letterhead, Berrien Springs MI, 1987 November 12. In full: “To Frank From Muhammad Ali Love is the net, where Hearts are caught like Fish and a fine sketch of a shining heart drawn by Ali and dated 11-12-87”. Mailing folds, else fine condition. Ali sometimes adds a poem along with his signature, this one with a drawn heart is remarkable. 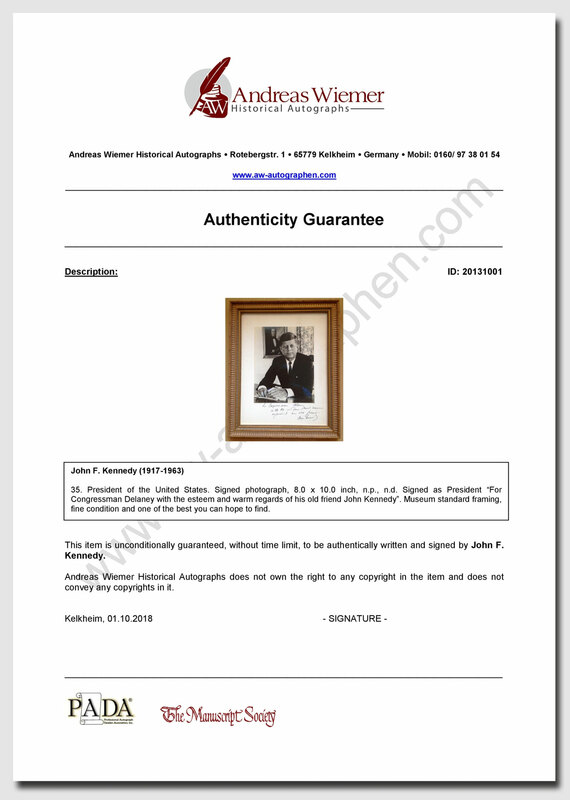 Additional JSA Letter of Authenticity included. French sculptor who is best known for designing the Statue of Liberty. Postcard signed and inscribed “Bartholdi”. 1p., 5.5 x 3.5 inch, Paris 1902 (postmark), in French. The French Sculptor, in his own hand, sends his best wishes to his correspondent. Addressed in another hand to the verso and post-stamped. Handling wear, else fine. John Gutzon de la Mothe Borglum was a Danish-American artist and sculptor famous for creating the monumental presidents' heads at Mount Rushmore, South Dakota. 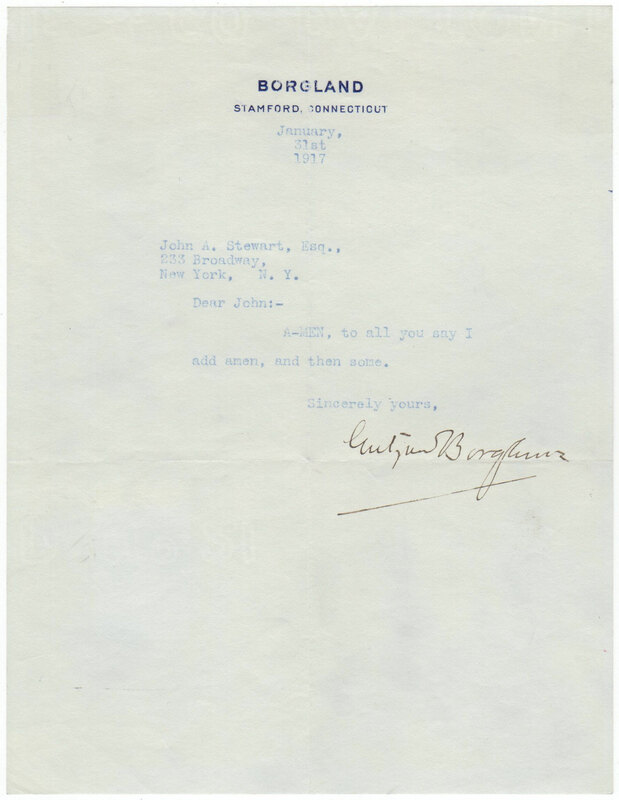 Typed letter signed “Gutzon Borglum”. 1p., 6.0 x 8.0 inch, personal letterhead, 1917 January 31. Brief letter to John A. Stewart, in full: "A-MEN, to all you say I add amen, and then some." In fine condition, with light show-through from four pieces of mounting tape on the reverse. American naval officer, aviator and explorer. Typed letter signed “R.E. Byrd”. 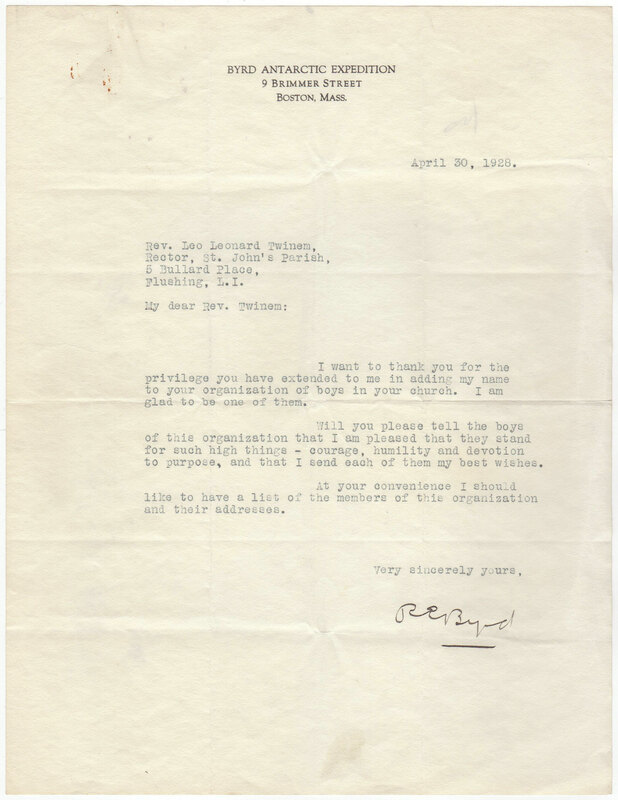 1p., 8.5 x 11.0 inch, Boston, 1928 April 30. On his Byrd Antarctic Expedition letterhead. Letter to Rev. Leo Leonard Twinem. In full: “I want to thank you for the privilege you have extended to me in adding my name to your organization of boys in your church. I am glad to be one of them. Will you please tell the boys of this organization that I am pleased that they stand for such high things – courage, humility and devotion to purpose, and that I send each of them my best wishes. At your convenience I should like to have a list of the members of this organization and their addresses.” Mailing folds, handling wear and minor paper clip stain, else good condition. Prominent Spanish surrealist. Signature “Dali 1975” and underline in his hand. 1p., 8.5 x 11.25 inch, n.p. Red piece of thin cardboard removed from a book or catalog. Signed, dated and underlined by Dali in black felt-tip pen. Minor handling and corner wear, else fine condition. Impressive and fine example! Manager of the Luftschiffbau Zeppelin, commander of the famous Graf Zeppelin for most of its record-setting flights, including the first airship flight around the world, making him the most successful airship commander in history. Signature in pencil “DrHugo Eckener”. 1p., card, 4.0 x 3.5 inch, n.p., n.d. (1930). Below Eckener’s signature in a different hand in pencil “Nach glücklicher Heimkehr von der Weltumsegelung Juni 1930”. Minor mounting residue on verso, else fine condition. 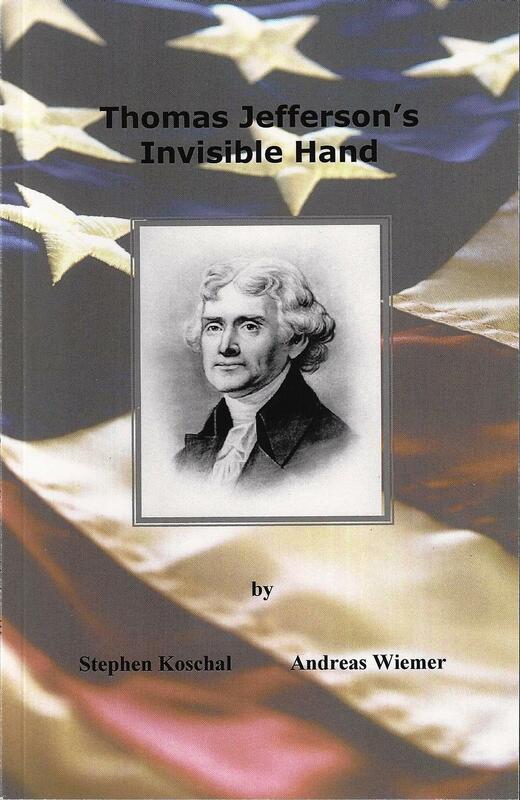 American inventor and businessman. He developed many devices that greatly influenced life around the world, including the phonograph, the motion picture camera, and a long-lasting, practical electric light bulb. Vintage sepia photograph signed “Thos A Edison”. The image depicting the inventor in a formal half length pose. 7.0 x 10.5 inch (sight) and matted in gray – overall 10.75 x 14.25 inch. Signed in bold black fountain pen ink. Photograph by Walter Scott Shin of New York and signed by him in pencil to the lower border. Two spots on Edison’s head, minor bends, some slight scuffing just affecting the signature, else good condition. American inventor and businessman. He developed many devices that greatly influenced life around the world, including the phonograph, the motion picture camera, and a long-lasting, practical electric light bulb. Signature “Thomas A Edison”. 1p., 4.25 x 5.5 inch, n.p., n.d. Small sheet of paper containing other signatures, possibly from a guest book. Excellent signed in pencil by Edison at the top. Handsomely matted in gray with a photograph of Edison to an overall of 11.75 x 7.75 inch. Both items removable affixed with photo corners. Good condition. Edison trademarked his signature in 1899 and he rarely signed his name as "Thomas". Virtually all of his later signatures have his first name abbreviated as "Thos”, that indicates that he signed this photo until 1899. Scottish-born scientist, inventor, engineer and innovator who is credited with inventing and patenting the first practical telephone. 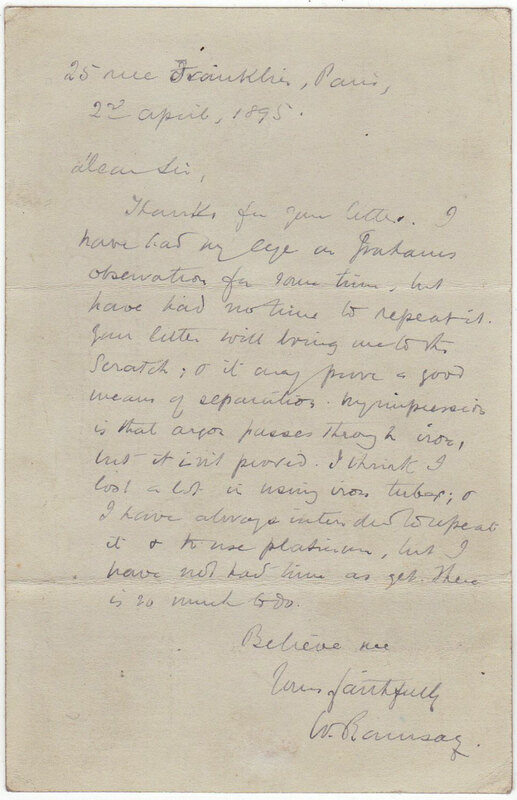 Typed letter signed “Alexander Graham Bell”. 1p., 8.0 x 5.25 inch, Washington, D.C., 1903 January 8. 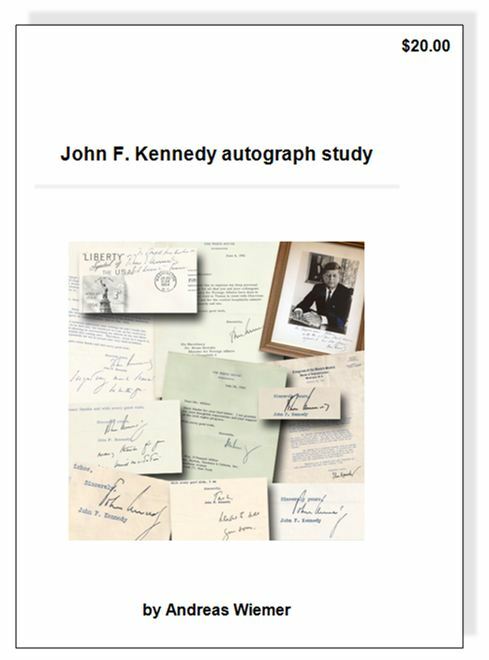 On his “1331 Connecticut Avenue” stationery. Letter to Mr. W. N. Petch in Toronto, Ont. In full: “In response to your note of January 3rd. It affords me much pleasure to send you my autograph attached to this note.” Mailing folds, else fine condition and with excellent signature. Accompanied by the original mailing envelope. German architect and founder of the Bauhaus School. Signed card “Walter Gropius Cambridge/ Mass 1967”. 5.5 x 3.75 inch. 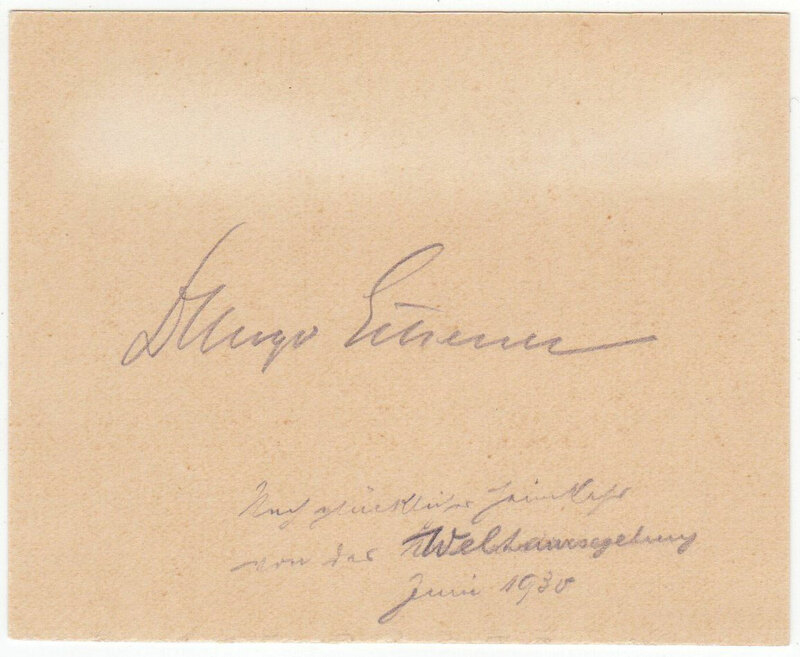 Stamp at the top “Autogrammkarte (autograph card)”. In fine condition. German chemist and pioneer in the fields of radioactivity and radiochemistry who won the Nobel Prize in Chemistry in 1944 for the discovery and the radiochemical proof of nuclear fission. Autograph letter signed “Otto”. 2pp., 6.5 x 7.75 inch, n.p., Freitag Abend, 1918 May 31. To his wife Edith in Berlin. In German: “Nur ganz kurz ein paar Zeilen. Ich bin hier sehr gut angekommen, wurde … von meinem Freund Rehfeldt an der Bahn abgeholt. Wir wohnen entzückend …Morgen früh fahre ich mit dem General per Auto nach Spa; er hat dort zu tun, und ich kann es bei dieser Gelegenheit gleich bequem sehen. Mit der elektrischen Bahn fährt man nämlich über 5/4 Stunden hin, das ist mir zuviel. Sehr anstrengen kann ich mich vorerst durchaus nicht ... Der ärztliche Antrag über 4 Wochen Nauheim geht morgen fort ... Hier ist alles reichlich vorhanden, nur Kaffee ist knapp. Ausser dem Morgenkaffee, den wir so kriegen, müssen wir jeden anderen Kaffee mit 30 Pfennig pro Tasse zahlen ... Hast Du mit Karl noch tüchtig gekneipt? War das gestern an unserem letzten Abend nicht wie verhext mit den vielen Besuchen? ... Komme Du jetzt aber auch mal etwas zur Ruhe; mit dem Garten und den Motten etc. hast Du noch immer reichlich zu tun ... Iss gut und lass Dirs gut gehen. Einen lieben Abschiedskuss, am Bahnhof hab ichs ja nicht gewagt trotz des dezenten Karl!" Mailing folds, else fine condition. German chemist and pioneer in the fields of radioactivity and radiochemistry who won the Nobel Prize in Chemistry in 1944 for the discovery and the radiochemical proof of nuclear fission. Signed Christmas card “und schöne Weihnachten Ihr Otto Hahn”. 10.0 x 5.5 inch (unfolded), n.p. (Göttingen), n.d., portrait photo of Max Planck on the left. Written and signed in dark blue ink as President of the Max Planck society in Göttingen, Germany. In good condition. American author, political activist, and lecturer. 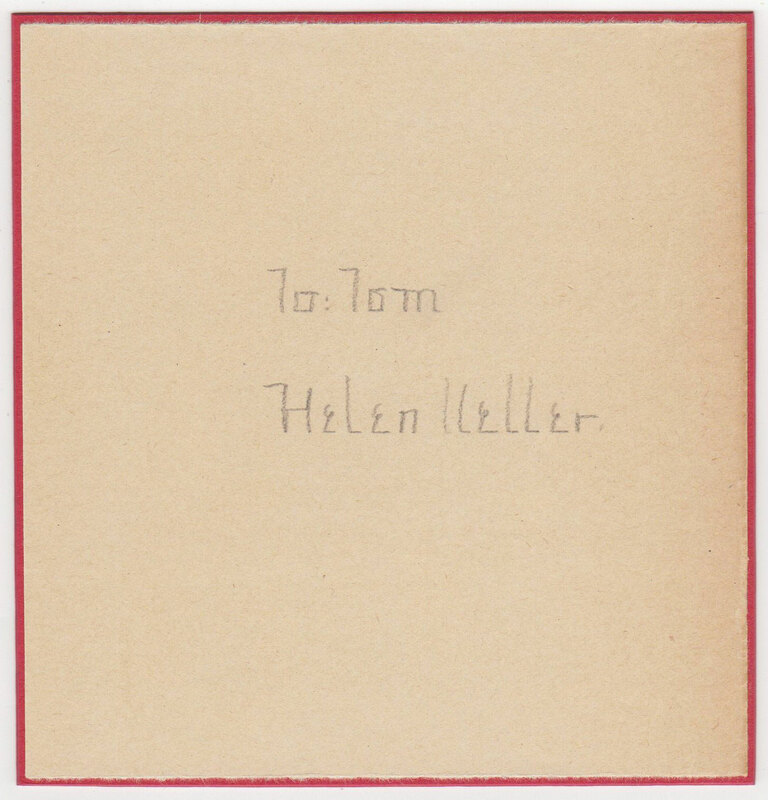 Signature and dedication “To: Tom Helen Keller”. 1p., probably a page from a book or album, 5.0 x 5.25 inch, n.p., n.d., written and signed in pencil. Mounted on a slightly larger piece of red cardboard. Fine condition. Austrian artist, poet and playwright best known for his intense expressionistic portraits and landscapes. Signed art postcard “Oskar Kokoschka”. 6.25 x 4.75 inch, n.p., n.d. (about 1979). Portrait Tilla Durieux, Kokoschka 1910. Also included is an autographed letter signed by Kokoschka’s wife Olda Kokoschka (1915-2004), dated 1979 March 20, regarding birthday wishes, flowers and Oskar Kokoschka’s tiredness. Fine condition. French diplomat and later developer of the Suez Canal, which in 1869 joined the Mediterranean and Red Seas, substantially reducing sailing distances and times between Europe and East Asia. 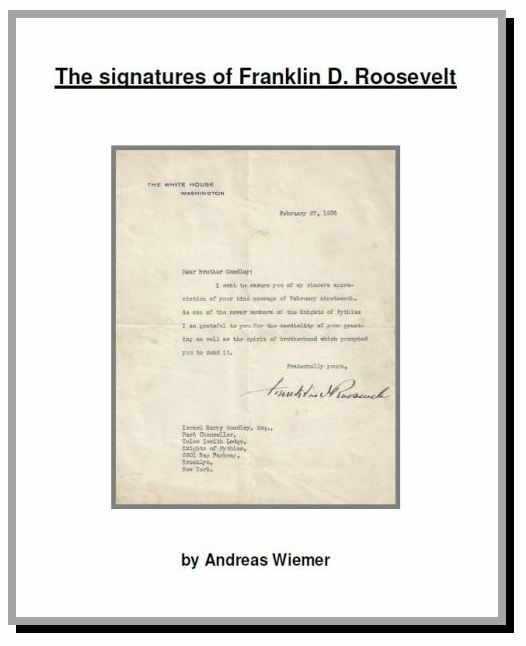 Autograph letter signed “Ferd. de Lesseps”. 1p., 8.25 x 10.5 inch, Compagnie Universelle du Canal Maritime de Suez letterhead, 1862 June 4. 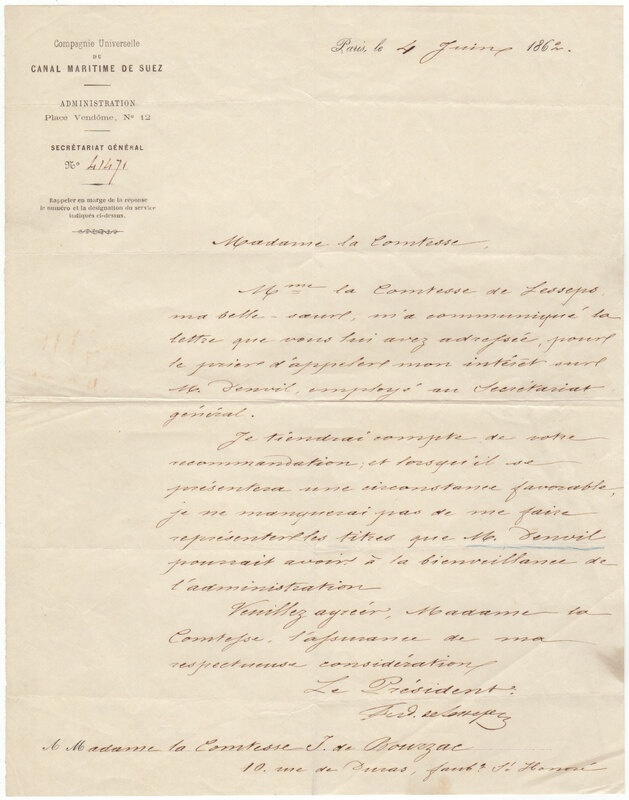 Untranslated letter to Madame la Comtesse de Bourzac. In fine condition, with intersecting folds and scattered light creasing. Uncommon on Suez Canal stationery. German chemist who made major contributions to agricultural and biological chemistry and was considered the founder of organic chemistry. Autograph letter signed “J. Liebig”. 1p., 4.25 x 5.5 inch, n.p., n.y. (probably Munich about 1855). Addressed to his brother-in-law, the writer and philosopher Moritz Carrière (1817-1895). Liebig asks his brother-in-law if he can call Dr. Ludwig Steub. In German in full: "Lieber Moritz Wolltest Du nicht so gut sein heute mit Dr. Steub (Ludwig Steub) zu sprechen, der seit Donnerstag hier ist; … diese Sache zu erledigen“. Mailing folds, minor stain, top right corner repaired on verso, else good condition. Inventor of photographic equipment, along with his brother, Louis Jean. In 1893 they developed a cine camera, the cinématographe, and showed the first motion pictures using film projection in 1895. They also invented the Autochrome screen plate for colour photography in 1903. Signed and inscribed card “Lumiere”. 1p., 5.0 x 3.25 inch, dated in Lumiere’s hand “26.2.(19)35”. Inscribed in French, fine condition. Together with his brother Auguste one of the first filmmakers in history. They patented an improved the cinematograph and showed the first motion pictures using film projection in 1895. 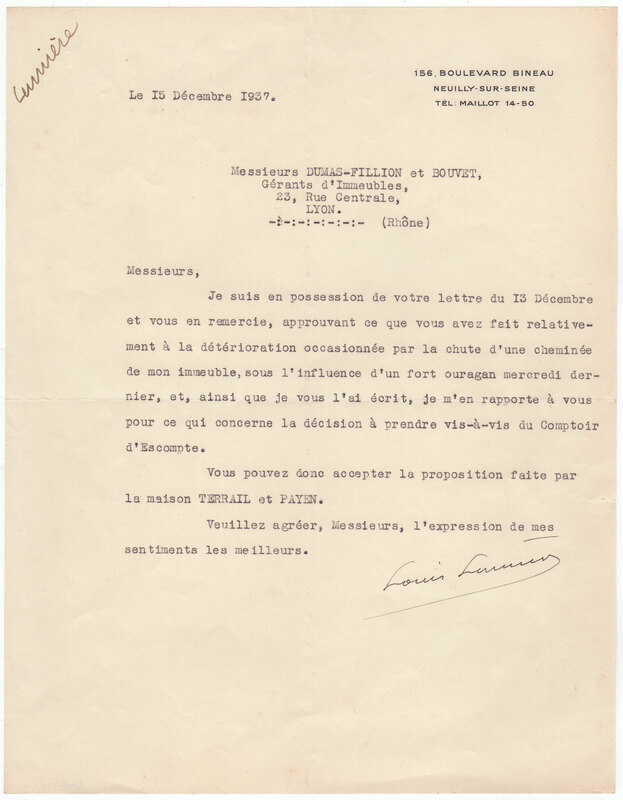 Typed letter signed “Louis Lumiere”. 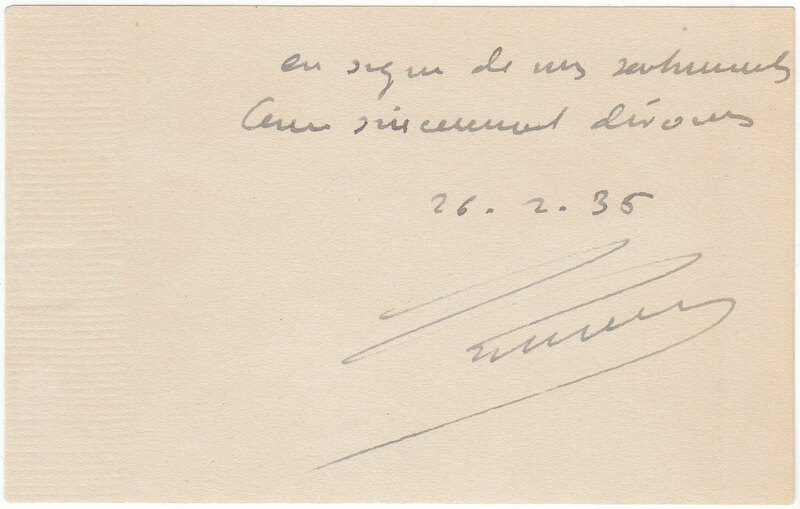 1p., 8.25 x 10.5 inch, Neuilly-Sur-Seine, 1937 December 15, on his personal printed stationery. To “Messieurs Dumas-Fillion et Bouvet”, in French. Lumiere informs his correspondents that he has received their letter and states in part: “I approve what you have done related to the damages that the falling of a chimney of my building may have caused…”. Fine condition. Italian inventor and electrical engineer, known for his pioneering work on long-distance radio transmission and for his development of Marconi's law and a radio telegraph system. He is often credited as the inventor of radio and he shared the 1909 Nobel Prize in Physics with Karl Ferdinand Braun. Document signed “G. Marconi”. 1p., double-sheet, 11.75 x 15.5 inch. Roma, 1930 February 18. Blind embossed seal “Consiglio Nazionale delle Ricerche”. Signed by Marconi as President and countersigned by the General Secretary. Nomination for Vittorio Peglion Presidente Onorario del Comitato Nazionale per l'Agricoltura. Mailing fold, else fine condition. The Consiglio Nazionale delle Ricerche (CNR) or National Research Council, is an Italian public organization set up to support scientific and technological research, Marconi was President from 1927-1937. German Realist artist noted for drawings, etchings, and paintings. Along with Caspar David Friedrich, he is considered one of the two most prominent German artists of the 19th century. Signed and inscribed photograph “Meinem Neffen Julian Martini Berlin u. Breslau d. 9. Mai 1904 in Erinnerung”. 4.0 x 5.75 inch photograph on a 7.75 x 10.25 inch photographers mount. Photo by E. Bieber (1903). A fine half length portrait of Menzel. Mount discolored, handling wear, ink stroke, writing dark. Remarkable signed photograph, uncommon especially in this size. Catalan, Spanish painter, sculptor and ceramicist. Color reproduction of one of Miro's uncommon mixed-media pieces. Printed on a glossy 8.5 x 11.0 inch sheet, removed from a catalog of his works and signed at bottom. Fine. 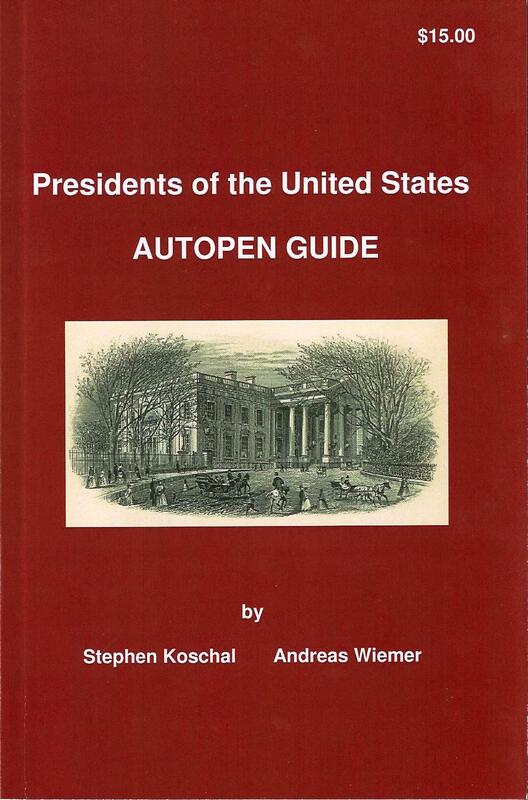 German classical scholar, historian, jurist, journalist, politician, archaeologist and writer. Generally regarded as one of the greatest classicists of the 19th century. His work regarding Roman history is still of fundamental importance for contemporary research. He received the Nobel Prize in Literature in 1902 for being "the greatest living master of the art of historical writing”. Autographed letter signed “Mommsen”. 2pp., recto and verso, 5.5 x 8.5 inch. On his personal stationery, Berlin, 1874 October 28. To Konrad Reichard, editor of the newspaper “Im neuen Reich”, regarding a publication in his newspaper. In German: „Es geschieht mit aufrichtigem Bedauern, daß ich Ihre freundliche Aufforderung ablehne; aber ich kann nicht anders. Diese Reden bei der Uebernahme des Rectorats pflegen nicht gedruckt zu werden ... Es würde den größten Anstoß geben, wenn ich einen solchen solennen Act in einer auswärtigen Zeitschrift ... publicirte ...". Mailing folds, handling wear, else fine condition. German classical scholar, historian, jurist, journalist, politician, archaeologist and writer. Generally regarded as one of the greatest classicists of the 19th century. His work regarding Roman history is still of fundamental importance for contemporary research. He received the Nobel Prize in Literature in 1902 for being "the greatest living master of the art of historical writing”. Autographed letter signed “Mommsen”. 1p., 3.75 x 6.0 inch. On his personal stationery. Heringsdorf, 1875 August 10. To Konrad Reichard, editor of the newspaper “Im neuen Reich”, regarding a publication in his newspaper. In German: „Die Rectorreden werden nach Berliner Usance von der Universität publicirt. Erscheint Ihnen eine Reproduction im N.R. zweckmäßig, so bin ich damit gern einverstanden …“ Mailing folds, else fine condition. Czech Art Nouveau painter and decorative artist, known best for his distinct style. He produced many paintings, illustrations, advertisements, postcards and designs. Signed postcard “Mucha”. 3.5 x 5.5 inch, n.p. n.d. Signed by the artist in black ink, colour postcard depicting “The Humble Will Revive”. In fine condition. Czech Art Nouveau painter and decorative artist, known best for his distinct style. He produced many paintings, illustrations, advertisements, postcards and designs. Signed postcard “Mucha”. 3.5 x 5.5 inch, n.p. n.d. Signed by the artist in black ink, colour postcard depicting “Blessing in the Merciful”. In fine condition. Norwegian explorer, scientist, diplomat, humanitarian and Nobel Peace Prize laureate (1922). Autographed letter signed “Fridtjof Nansen”. 1p. (double page), 5.75 x 8.25 inch, “Delegation de Norvege” letterhead. Genf (Geneve), 1929 September 27. 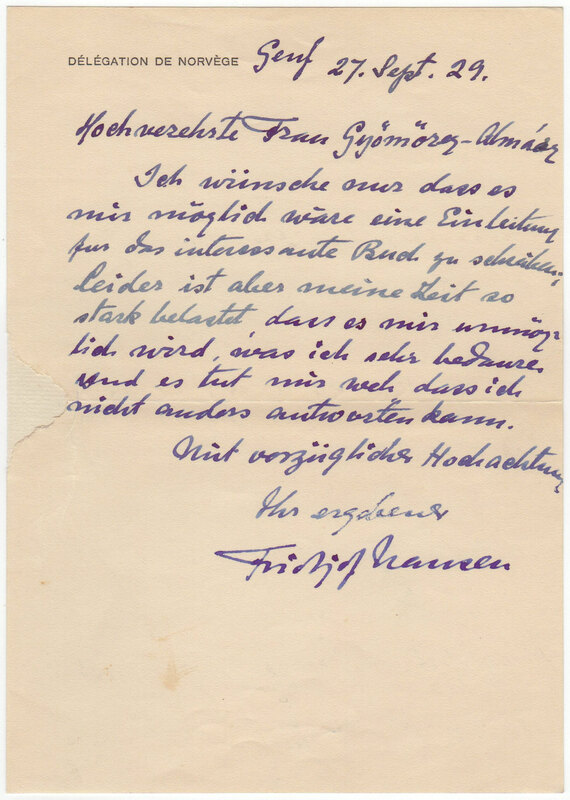 Written in blue ink to Mrs. Gyömöres-Almares, in German: “Hochverehrte Frau Gyömöres-Almares Ich wünsche nur dass es mir möglich wäre eine Einleitung für das interessante Buch zu schreiben; leider ist aber meine Zeit so stark belastet, dass es mir unmöglich wird, was ich sehr bedaure. Und es tut mir weh, dass ich nicht anders antworten kann. Mit vorzüglicher Hochachtung Ihr ergebener”. Horizontal mailing fold, area of paper loss to the left edge which is repaired with a piece of paper inside the double page, else good condition. Spanish painter, sculptor, printmaker, ceramicist, stage designer, poet, playwright and one of the greatest and most influential artists of the 20th century. Bookpage signed “POUR LEO - Picasso le 4.4.65”. 1p., 7.75 x 11.0 inch, n.p. Written and signed in blue artist crayon. On verso in a different pen and in pencil “THE PRIVATE WORLD OF PABLO PICASSO” by Davon Douglas Duncan, The Ridge Press, 1958. This is page 129 of this book. Leo was Leo Keller a German citizen who immigrated to the United States in the 1950s. 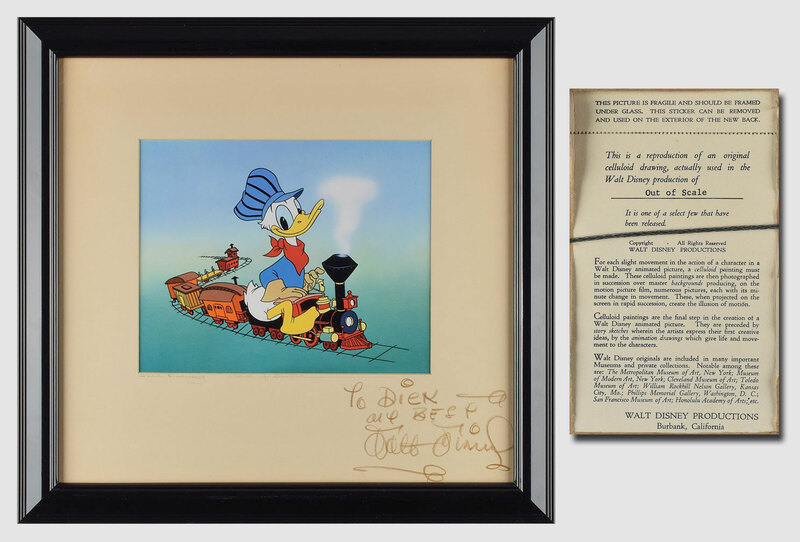 An avid collector, who received most of his autographs through the mail. Mailing folds, handling wear, corner bend and middle fold with a minor broke on the right. Else good condition and a very uncommon Picasso autograph with fine provenance. German theoretical physicist who originated quantum theory, which won him the Nobel Prize in Physics in 1918. Document signed “Planck”. 3pp. (bifolium), Berlin, 1904 August 6. Diploma for Karl Schulze „Wir Rector und Senat der königlichen Friedrich Wilhelm Universität zu Berlin“. 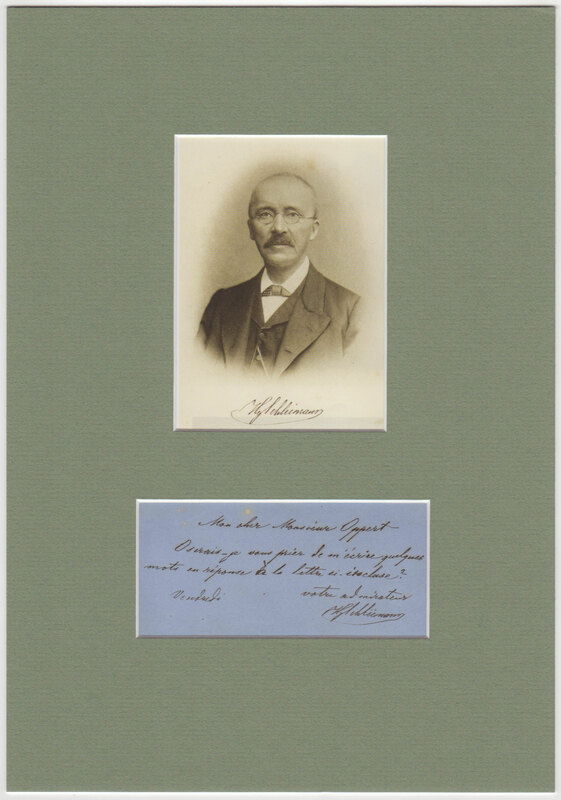 Countersigned by Ferdinand von Richthofen (1833-1905) as President, Paul Daude (1851-1921) as University Judge, Otto Pfleiderer (1839-1908) as professor and Max Planck. Mailing folds, slightly discolored, minor fold breaks, else good condition. German film director, producer, screenwriter, editor, photographer, actress and dancer. Signed postcard photograph “Leni Riefenstahl”. 4.25 x 6.25 inch, n.p., n.d. signed in black felt tip pen, fine condition. French sculptor whose works, including the iconic “The Kiss” and “The Thinker”, earned him a place among the most influential artistic figures of the late 19th and early 20th centuries. 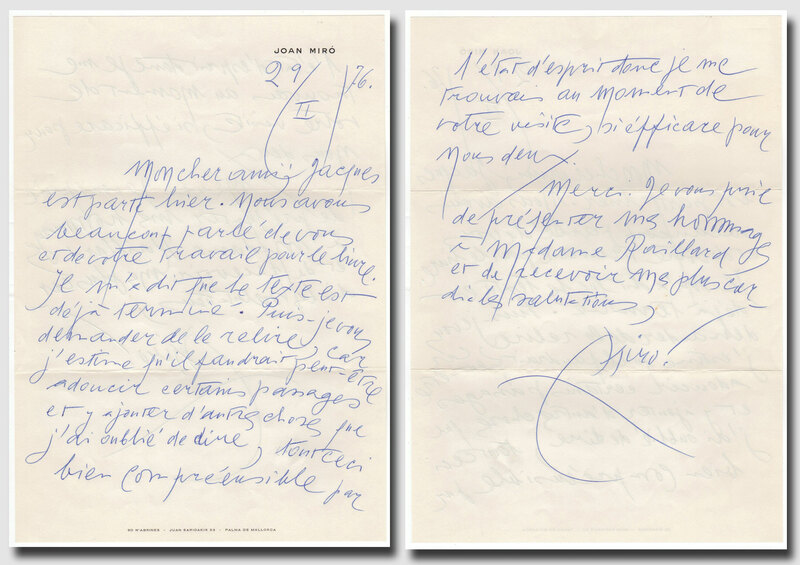 Letter signed „Auguste Rodin“. 2pp., recto and verso of a double-page, 6.0 x 7.75 inch. Paris, 1913 July 31. Addressed to Walter Zimermann, Secretary of the International Art Exhibition in Munich, who had acquired a Rodin bronze for the Bavarian State. 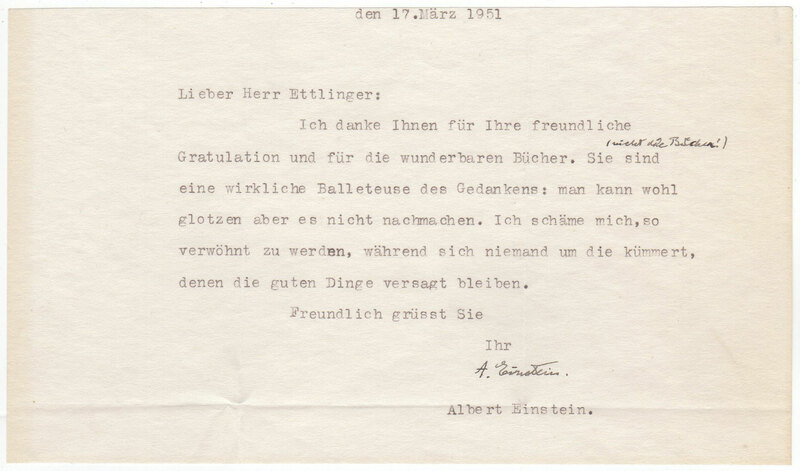 The artist thanks the city of Munich and the free State of Bavaria. In French: "J'ai le plaisir de vous accuser réception du contrat passé entre l'Etat Bavarois et moi pour l'achat du bronze 'Falguière', que je vous retourne signé ci-inclus. - Je suis heureux et fier que la ville de Munich, ville universellement connue comme centre artistique, on pourrait dire la capitale des arts, ait choisi un de mes bronzes. Je vous prie de transmettre mes remerciments les plus respectueux à l'Etat Bavarois. En vous faisant mer compliments pour la facon parfaite dont vous avez organise l'Exposition, veuillez agreer Monsieur l'assurance de mes sentiments les meilleurs.” Some stains, mounting residue inside the double-page, else good condition. French sculptor whose works, including the iconic “The Kiss” and “The Thinker”, earned him a place among the most influential artistic figures of the late 19th and early 20th centuries. 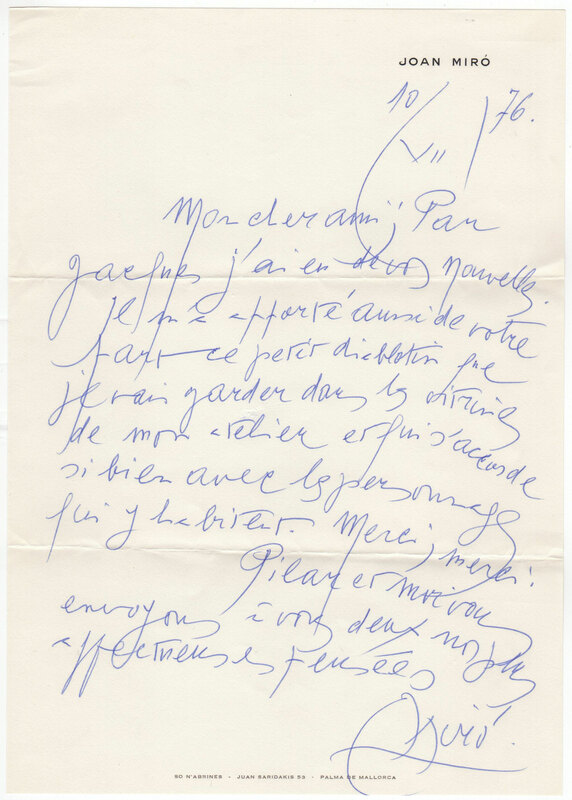 Autograph letter signed „Auguste Rodin“. 2pp. (double-page), 5.5 x 6.75 inch. 25 Via Gregoriana, Rome, 1915 February 11. To an unidentified lady, in French. Rodin sends his apologies to his correspondent and states: „…last Sunday I was at the restaurant Latour, my workshop from 2h30 to 3h30. I must have ran out of memory and this way missed your kind visit. Please forgive me...“ Mailing fold, else fine. German businessman and a pioneer of field archaeology. He was an advocate of the historical reality of places mentioned in the works of Homer. Schliemann was an archaeological excavator of Hissarlik, now presumed to be the site of Troy. Autograph letter signed “H. Schliemann”. 1p., 4.25 x 2.0 inch (visible), n.p., n.d. Addressed to the French-German Assyriologist Jules Oppert (1825-1905). 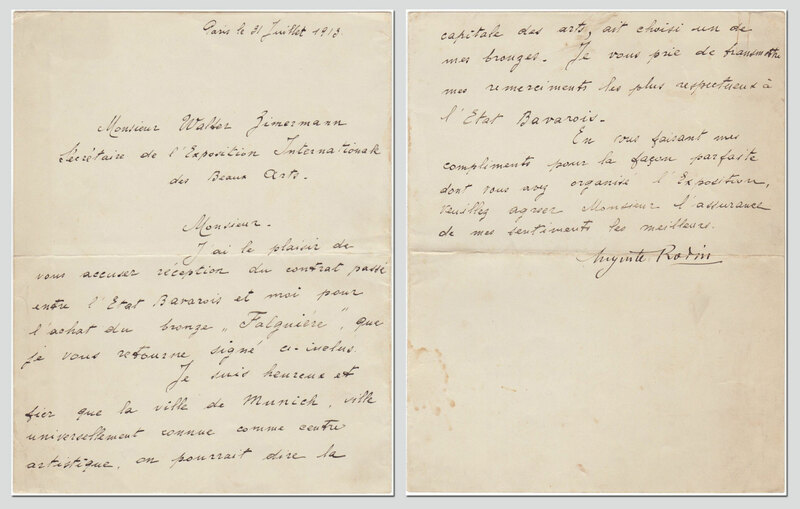 In French, in full: “Mon cher Monsieur Oppert … - je vous prier de en écrire quelques mots en response a la letter incluse?” Translated: “May I ask you to write a few words in response to the letter included?“ Handsomely matted in green with a photo of Schliemann (printed signature) to an overall of 8.25 x 11.75 inch. Excellent condition. German businessman and a pioneer of field archaeology. He was an advocate of the historical reality of places mentioned in the works of Homer. Schliemann was an archaeological excavator of Hissarlik, now presumed to be the site of Troy. Autograph letter signed “H. Schliemann”. 1p., 4.5 x 5.0 inch, Carlsbad, 1881 August 17. In German, in full: “Geehrter Herr, Ich haben Ihnen leider nichts anderes zu senden als die Einlage. Hochachtungsvoll“. Translated: “Dear Sir, Unfortunately, I have nothing to send you except the enclosure. Sincerely”. Mailing fold, probably slightly trimmed, writing dark and unaffected. French Neo-Impressionist painter who, working with Georges Seurat, helped develop the Pointillist style. Autograph manuscript, unsigned. 5pp., Brussels, 24 February, no year. Handwritten notes made on works he had studied in two museums; first about sketches to Delacroix’s famous Louvre mural painting "Apollo slays the Python" (1850/51). In parts: "… Musée Moderne / Esquisse du plafond d’Apollon de Delacroix, dans un etat merveilleux de conservation – C’est certainement ce que j’ai vu de lui le plus coloré … la femme blonde en robe bleu vert est certainement plus frais que n’importe quel Renoir … Musee Ancien – … le bras de la femme refleté bleu sur le haut et rose sur le bas – (Delacroix parle de ce principe) – les parties refletant le ciel, sont froids, celles refletant le sol sont chauds) …" Mentioned the painters Peter Paul Rubens ("merveilleuse etude") and Henri Regnault as well as the painting "Mars et Venus" ("Mars désarmé par Vénus" von Jacques-Louis David). Minor handling wear, else fine condition. German general and later aircraft manufacturer. He founded the Zeppelin airship company. Autograph note signed „Gf. Zeppelin”. Postcard, 5.5 x 3.5 inch, n.p., 1908. Additional in Zeppelin’s hand “Den Bestrebungen des vaterländischen Frauenvereins wünsche ich den besten Erfolg. November 1908“. Front shows the Strasbourg Cathedral and the over ride of a Zeppelin on August 4, 1908 - greeted with gunfire. Minor handling wear, else fine condition.